Words don’t do this cake justice, so I’m going to keep it short. This honey cake is perfect any time of year, and this time I used fresh fruit to pair with it. Decorating with fruit is a brilliant decision. Fruit is beautiful, and no matter how you arrange it, you know it will make a gorgeous presentation. The layers are fluffy and tender and the frosting is my favorite cream cheese frosting. This cake is SO easy, REALLY, it should be in every cook’s recipe collection. Preheat the oven to 300 degrees. Grease two round cake pan. You can use either 9 or 10 inch pans. 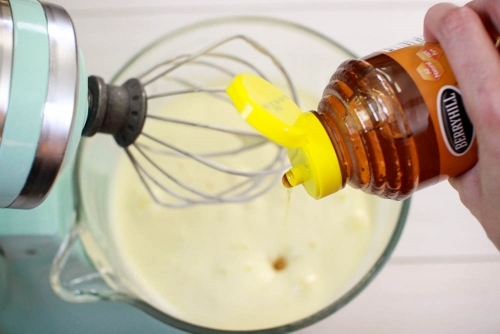 Using a hand mixer or a standing mixer with the whisk attachment, beat the eggs and gradually add in the sugar. Mix until the eggs are pale and fluffy, at least 5-7 minutes. Add the honey. In a small bowl, whisk together the flour and the baking soda. Add to the batter and mix just until the flour is all incorporated. Divide the batter evenly between the two can pans. I used my 9 inch springform pans, but I usually use two 10 inch baking pans. Bake in the preheated oven until a toothpick inserted into the center of the cake comes out clean, about 20-30 minutes. If you’re using the 9 inch cake pans, they will bake longer than the 10 inch cake pans. The 9 inch cake will be much taller too. Take out the cake layers from the oven, cool for 5 minutes and then take out of the pans and place on a cooling rack. 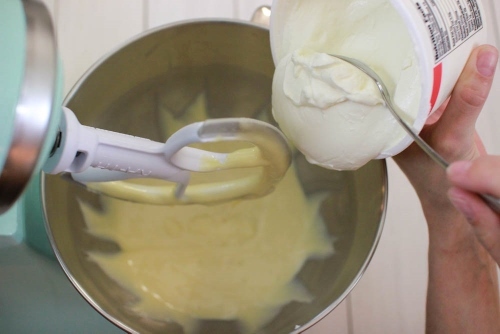 With a hand mixer or using a standing mixer and a paddle attachment, mix together the cream cheese and condensed milk, until they are smooth. You will use 3/4 of the can or the full can, depending on how sweet you like your cakes to be. Add the sour cream and vanilla. 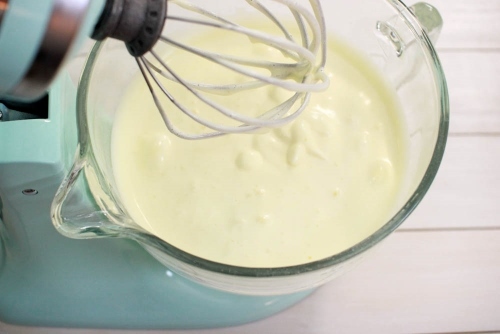 In another bowl and a whisk attachment, whip up the chilled heavy cream until stiff peaks form. 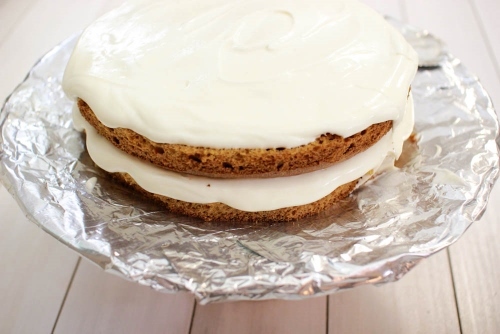 Gently fold in the whipped cream into the cream cheese mixture until the frosting is smooth. Place some aluminum foil around the edges of the plate where you’ll be assembling the cake. This will keep the sides of the plate clean while you’re working with drippy frosting, crumbs and almonds. 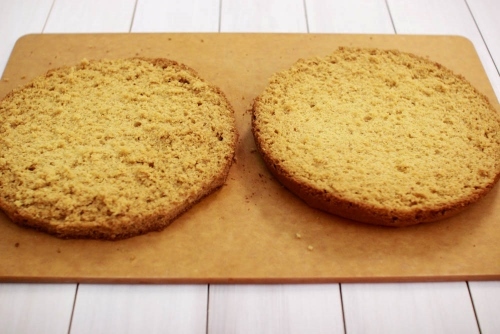 Cut each cake layer in half horizontally. Generously spread each cake layer with frosting. Don’t smoosh the cake too much while you’re doing it. Spread more frosting on the sides and top of the cake. You may need to let the cake stand int he refrigerator for a little while, so that it’s easier to decorate. 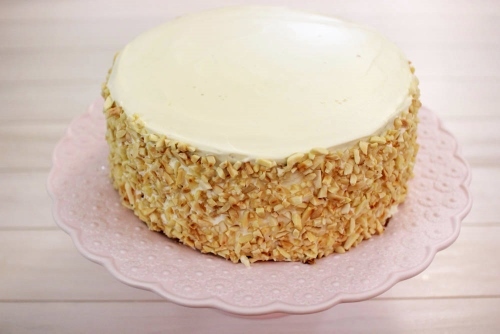 Using the palms of your hands, coat the sides of the cake with toasted almonds. 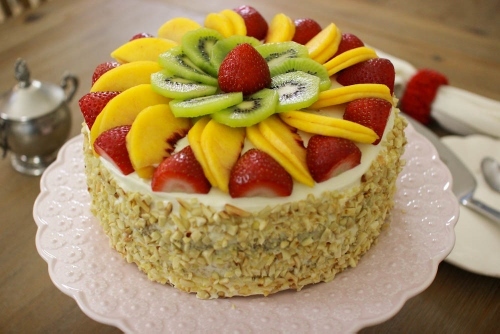 Decorate the top of the cake with fruit. If you’re going to be serving the cake the next day, leave the fruit off the cake and decorate it before serving. 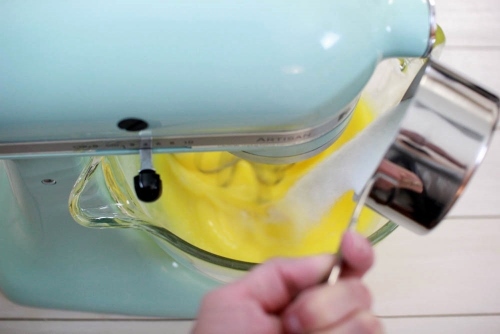 Using a hand mixer or a standing mixer with the whisk attachment, beat the eggs and gradually add in the sugar. 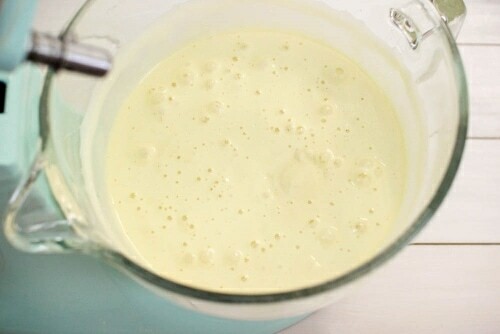 Mix until the eggs are pale and fluffy, at least 5 minutes. 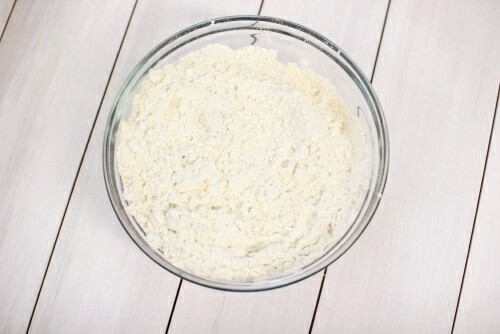 In a small bowl, whisk together the flour and the baking soda. Add to the batter and mix just until the flour is all incorporated. Divide the batter evenly between the two can pans. I used my 9 inch springform pans, but I usually use two 10 inch baking pans. Bake in the preheated oven until a toothpick inserted into the center of the cake comes out clean, about 20-30 minutes. 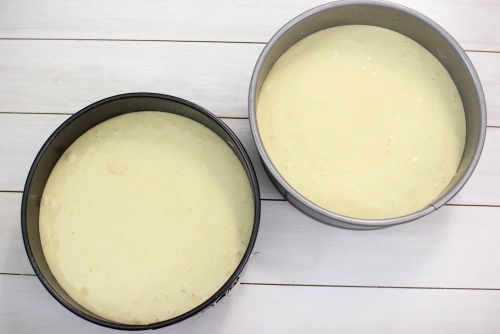 If you're using the 9 inch cake pans, they will bake longer than the 10 inch cake pans. The 9 inch cake will be much taller too. 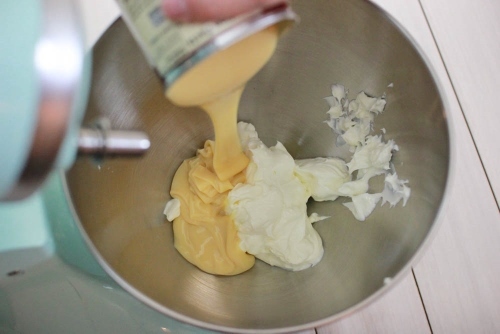 With a hand mixer or using a standing mixer and a paddle attachment, mix together the cream cheese and condensed milk, until they are smooth. You will use ¾ of the can or the full can, depending on how sweet you like your cakes to be. Add the sour cream and vanilla. 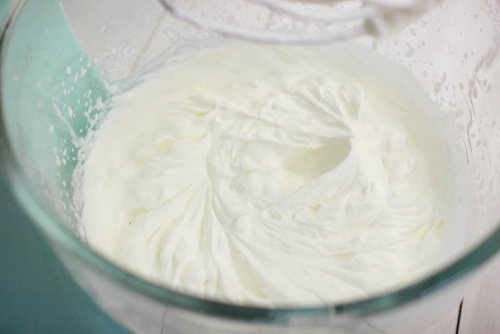 In another bowl and using a whisk attachment, whip up the chilled heavy cream until stiff peaks form. 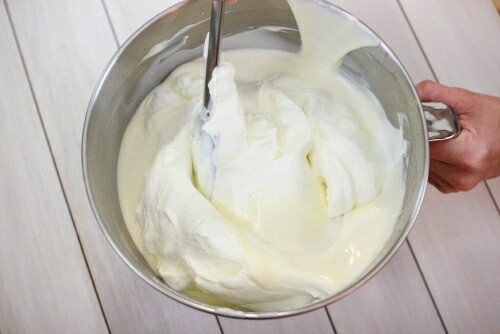 Gently fold in the whipped cream into the cream cheese mixture until the frosting is smooth. 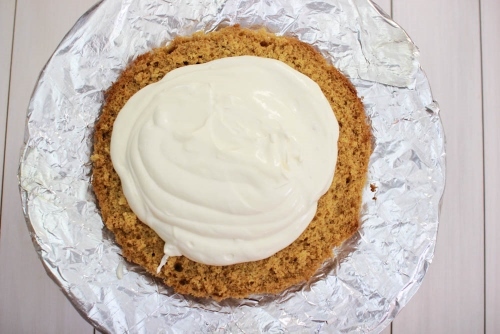 Place some aluminum foil around the edges of the plate where you'll be assembling the cake. This will keep the sides of the plate clean while you're working with drippy frosting, crumbs and almonds. Generously spread each cake layer with frosting. Don't smoosh the cake too much while you're doing it. Spread more frosting on the sides and top of the cake. You may need to let the cake stand int he refrigerator for a little while, so that it's easier to decorate. 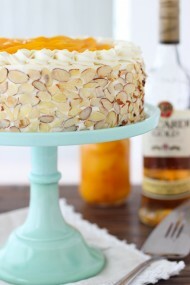 Using the palms of your hands, coat the sides of the cake with toasted almonds. Decorate the top of the cake with fruit. If you're going to be serving the cake the next day, leave the fruit off the cake and decorate it before serving. Up to 3 days, Jess. Thanks for posting, cake looks very yummy. Will try for sure!!!! Looks very delicious!!! Do you think it would work with fruits on the inside? Sure, Tanya. I’m sure fruit in the inside would work great too. I want to ask if you can taste the baking soda in the cake since the recipe uses 2 tspns. (Seems like a lot to me). Alena, 2 teaspoons is the correct amount for this cake. In my opinion, you can’t taste it in the cake. If you don’t add the full amount, the cake won’t be as tall or fluffy. Oh, wow! I can’t wait to try!!! Made it on Saturday, and cut it on Sunday. It was perfect, and surprisingly fast to make from beginning to end. This was one yummy cake. Except we didn’t have any fresh fruit, and my husband doesn’t like any nuts on the cakes, so I omitted those. I didn’t have 2 pans of exact size, so I used a 9 inch, and other a 10 inch. Once they baked, I trimmed the larger cake edges, grated them and that’s what I used for the sides and topping, simple and delicious. Next time, I’d have to buy the fruit, sounds like a great combination. That’s awesome to hear, Oksana! Very innovative of you to figure out how to make the recipe work with 2 different sized pans. Would it be ok to add cocoa to half of the batter to make half chocolate and have white cake? Sure, you can, Lena. I prefer the taste of the honey cake layers, but you won’t ruin it with cocoa. Can you tell me how sweet the cake is? I know everyone has a different opinion of what sweet is, but from 1-10 what would you give it. I tried the Tres Leches cake from Pioneer Women and we didn’t finish the cake because it was way too sweet. Also, what do you thing will happen to the cream if I cooked the condensed milk (I like the flavor of it cooked vs raw)? Just wanted to thank you for keeping up your food blog. I tried numerous of your recipes, and they all turned well. It makes me happy to see women who are good keepers of their home. May God bless your family. Did your little ones arrive? It’s hard to judge how sweet something is since everyone has different preferences, but I normally cut the amount of sugar in most recipes in half, since I don’t like things too sweet, either. In my opinion, I don’t think this cake is too sweet. The cake layers are not too sweet and you can make the frosting as sweet as you like by adjusting the amount of condensed milk that you add. I finally made this cake three weeks ago when I had guests over for dinner. Baking is not my forte, therefore I don’t bake often and when I do, I have to have a good feeling about the recipe. This cake was very easy and turned out good. Although 3/4-1 can of condensed milk was suggested to use for the cream, I will be using 1/2 a can tomorrow for Thanksgiving. I will also try adding chocolate ganache(not very sweet) over the cream, since fruit is out of season right now and I think chocolate will complement well. Thank you Olga. Your blog is my reliable “recipe book” that hasn’t failed me. I’m so happy to hear that you enjoyed the cake! Thank you so much for taking the time to tell me. Chocolate ganache will go great with this cake. Olga just wondering if you cooked the condensed milk for the frosting. My sister and I are planning to make this for my daughters birthday. Thanks for you time and I love your blog. God bless!! Happy birthday to your daughter, Roza! In my opinion, I think that using cooked condensed milk in the frosting doesn’t really go with the flavors of the cake layers, but it might work too. hi Olga. I made this cake for a little tea gettogether and everyone loved it…. my husband is a picky eater ….even he said ” from now on this is my favorite cake” lol…..
thank u so much for this delicious recipe…..
1. does the cream have to be runny the way it was? 2. how long can I freeze biskvit? I’m so glad you guys enjoyed the cake:). Thanks for taking the time to let me know. I know you can freeze cake layers, but I never do it myself, so I can’t tell you from experience. I think it would be fine for a month or so as long as you seal it well. In regards to the frosting, I like the texture and use it for most of my cakes. It’s my family’s and mine personal preference. If you prefer your frosting to be thicker, by all means use your own favorite frosting recipe. Toasted almonds? Is that by toasting them on fry pan? You can toast the almonds in a skillet or in the oven, Olga. Have you tried walnuts instead? Would it taste diff? Hi Olga! You can use walnuts if you’d like. Of course, walnuts taste different than almonds. I prefer almonds. Hi.. I would like to make a easy cake for my sons birthday, but he’s allergic to nuts. Do you think it’ll taste good with a more of a chocolatey cream (if I were to add cocoa) some Oreo cookie crumbs and omit the fruit? His party theme is “construction” ..
Just omit the nuts, Tanya. In regards to the chocolate frosting – personally I’ve never tried it, but it’s up to you. everybody has different taste preferences. You can definitely omit the fruit as well. Decorating a cake is very subjective; you can do what ever you’d like. Sounds like a fun party:). Happy birthday to your son! That’s awesome! I’m so glad it worked:). Thank you for recipe !!! Delicious cake,easy direction,great website. You’re welcome, Galina! I’m thrilled you liked it. hey Olga, i wanna try making this cake this weekend and wanted to have your opinion on, what do u think if i add rasbperries inside? u think that will be a good combination with honey? I’ve never personally tried it with raspberries, but I think it would work well. Let me know what you think. You’re welcome, Zoryana and thanks for the compliment. Yes, it’s a “sturdy” cake. It won’t fall apart if served on the same plate with other desserts. Just spread the batter around evenly in a 9×13 inch pan, it should be a thin layer, just enough to cover the bottom of the pan. I’m not sure exactly how many layer you will have, though, since I never make it in that size. I’m sorry you weren’t pleased with the results. No, I do not dissolve the baking soda in vinegar. Maybe you will like it better with less baking soda. I guess our family doesn’t seem to have a problem with it. Olga. Could you check the % of milkfat in your sour cream? Will 14% work? Other recipes call for 30%. But it looks like you use regular sour cream. I’ve never looked at the percentage of fat, Hasmik. I always just buy the regular sour cream at the store, not part skim, low fat, or whatever else is sold. hey olga, i have a question if serving the cake the next day, should the cake be left in the refrigerator over night? or is it better just leaving it out? I would store it in the refrigerator, Irina. Thanks for the recipe Olga, the cake was AMAZING!!!!! 🙂 and it turns out my mommy has the same exact recipe from the Europe hehe also when I made the cake I left it out over night, and put it in the refrigerator in the morning, it was just perfect!! Thanks again. Some of us from my church will be watching the opening of the olympics which take place in Russia in February. We thought it would be fun to have dinner and each bring a Russian dish. 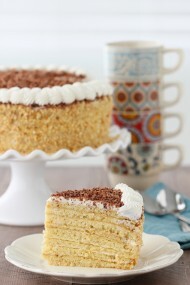 I love the look of this cake but we were wondering if it is truly a Russian Recipe or if it is just a good recipe of yours?? Thanks for your help. Yes, this is a Russian recipe. 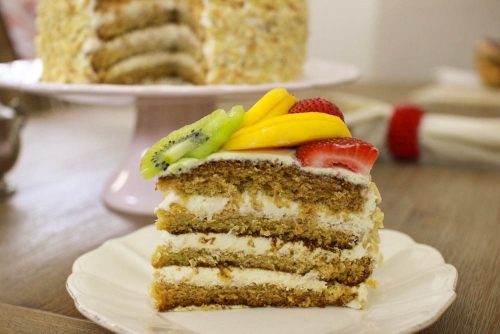 It’s very common to include honey in cake recipes and the frosting is very Russian as well. We made this in the former Soviet Union and I know that many other Russian make similar cakes as well. Thank you , Olga for this recipe. Made it today, and it was easy, tasty and quick! I didn’t have heavy whipping cream, so used cool whip instead. Came out great. I’m glad you liked it, Yelena:). Thanks for taking the time to write. Hello Olga, this recipe makes 2 cakes right? you need to make 2 cakes? Oh never mind Olga, I just didn’t look at the picture. Thanks for the great recipe! I’m glad you figured it out:). thanks it is good cake! ill be make it now always its really easy too! That’s wonderful, Mila! I am thrilled that you all enjoyed the cake. It IS easy, isn’t it? I love that about this recipe. So I made this cake on Monday and instead of making it super tall with 4 layers, I made 2 smaller cakes. My family couldn’t get enough of it 🙂 it’s really yummy and it’s not so time consuming as many cakes. In my opinion it tastes even better the 2, 3 or even 4th day. Thank you Olga for this easy recipe! I’m so happy that you enjoyed this cake, Elli! That’s wonderful. It IS such a simple cake to prepare and delicious too. Your cake recipe was amazing. We are Russian and Ukrainian decent and our children love honey cake. This cake was fantastic. I made a honey cake before but it was heavy. I loved the lightness of your recipe. My children loved it. And it was a show stopper. The guests took pictures. Thanks for sharing this recipe. I will keep it and use it always. I made this cake for guests before and got so many compliments! Made it again for tomorrow- going to a birthday party. It is super easy to make, but the frosting is so drippy, I think it needs to be a little improved. I even tried putting less sour cream and condensed milk, sweetened with powdered sugar, but still turned out runny. Maybe you have any suggestions? Once the cake absorbs it all, it has a heavenly soft taste, but the putting together part gets messy. Yes, the frosting is on the thinner side. That is why the cake turns out so soft and tender. I personally prefer it this way. If you don’t, you can make a cream cheese frosting instead. Or a buttercream frosting. The cake will not be as tender, though. Easy ,DElICIOUS ,love this cake !!! Can’t wait to dig in! Just frosted it! Although my frosting was somewhat runny too like one reader mentioned.. And I seem to have a lot left over even though I frosted generously!? I am going to leave it in the frig and frost some more tomorrow and see if it gets thicker?.. Thanks for the recipe though!! Very simple indeed!! I made this cake last 14 months ago for my youngest, and still getting request for it. Thank you so very much for suggesting it. 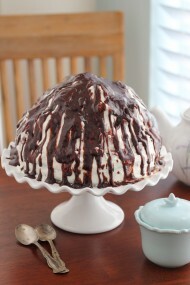 Here’s the next challenge, though: I need to make it for a dairy-free party. Any idea what I can do besides non-dairy ganache topping? Maybe some sort of thickened jam? Hi Svetka. I am thrilled to hear that you enjoyed this cake. I really have no idea what you can use for this cake to make it dairy free. What kind of frosting will you be making? I don’t have any recipes of dairy free frostings. As for the ganache, most chocolates have dairy in them too. Sorry, I really have no experience with dairy free cooking. Hi, Olga! 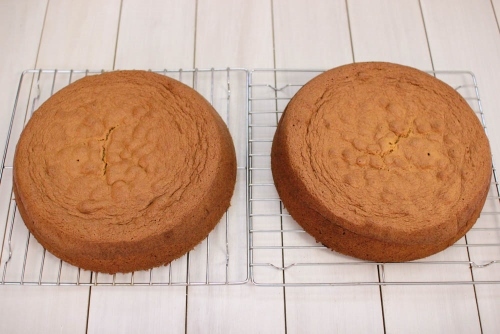 I’m going to try that cake this week, the problem is that I can bake it only on Saturday morning, but it must be served around 6 pm evening… Will there be enough time for the cream to soften the cake layers, if I’ll be done with assembling it around 10 am??? Should I put it in the refrigerator or leave it on the counter? Thanks in advance for taking time to answer!!! I think it should be enough time for the cake to soften. Leave it at room temperature for about an hour and then put it in the refrigerator. I’m sorry to hear that it didn’t work out for you, Hailey. Did you beat the frosting long enough after adding the heavy cream? Was the heavy cream very cold? Happy birthday to your boyfriend, Olga. I’ve never had any issues with this cake and it’s always been one of the cakes that I know I can whip up very quickly with minimum effort and comes out great every time. I hope you enjoy it just as much as I do. What i can use for cream cheese, just don’t have a cream cheese? Cream cheese is a pretty important ingredient in the frosting, Nataliya. You can just omit it and use more sour cream, but it will be much more runny and have a different flavor. Hello! I love your blog. I am making this cake right now and I have a lot of frosty left over. Any ideas as to what I can do with it? Thank you! I like to use a lot of frosting, because as the cake stands, the frosting will seep into the cake and make it very moist and delicious. If you have a lot of it left over, you can use it as a filling in crepes. Thanks! I️ will definitely use more next time. This time, we just spooned the extra over each piece as we ate. It was delicious, and my husband said it reminded him of cake he ate growing up! Hello! I was just wondering if it would be ok to just use 16oz of sour cream and 2 8oz packages of softened cream cheese instead of 24 oz of sour cream and 1 8oz package of softened cream cheese. Would that work and would make it taste more “cheese-cakey”? Thank you! Yes, that would work too, Vicky:). I made this cake for Christmas and it was so good. It was surprisingly easy to make and everyone commented on how tasty it was. The best part was all the flavours that reminded me of my childhood. I am not into baking but this encouraged me to try more recipes from your website. I am so glad you enjoyed it! It’s so awesome that you decided to give it a try and were happy with the results. This cake looks amazing – I am going to make it for my parent’s golden wedding anniversary. What a wonderful occasion for your family to celebrate. Happy Anniversary to your parents. I think it’s wonderful that you are making them a cake, Katy. The flour I use in all my recipes unless otherwise noted is unbleached all purpose flour. The cake was a huge success! Easy to make, delicious, light and very moist. The hardest part was transporting it 60 miles to my parent’s! I put the frosting and nuts on the night before and refrigerated, but left the fruit till I arrived. It wasn’t too bad! Can’t work out how to post a photo, but it looked amazing. Lots of compliments – thank you!